CAPT Daniel Dusek is a native of Waldport, Oregon. He earned a bachelor’s degree in Atmospheric Sciences from the University of Washington in 1989 and was commissioned as an Ensign through the Naval Reserve Officer Training Corps. His initial sea tour was in USS LEWIS B. PULLER (FFG 23), homeported in Long Beach, California, serving as Damage Control Assistant, Navigator and Administrative Officer. In 1993 he was assigned to USS NIMITZ (CVN-68), homeported in Bremerton, Washington as OI Division Officer and Training Officer. Following Department Head School, he reported as Chief Engineer in USS TAYLOR (FFG 50), homeported in Mayport, Florida, deploying to the Arabian Gulf in support of Maritime Interdiction Operations. In 2000 he was assigned to Commander, Destroyer Squadron NINE in Everett, Washington as Material Officer. In 2001 he deployed to the Arabian Gulf in support of Operation Enduring Freedom. In 2002 CAPT Dusek reported to USS INGRAHAM (FFG 61) homeported in Everett, Washington, as Executive officer. During this tour he deployed to SEVENTH Fleet in support of Operation Iraqi Freedom. CAPT Dusek commanded USS FITZGERALD (DDG-62) April 2007 through October 2008. 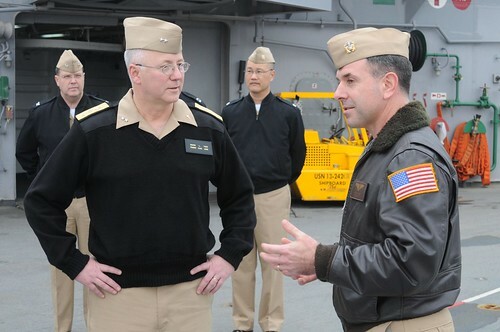 During his tour in USS FITZGERALD, he conducted operations in the C7F AOR winning two consecutive DESRON 15 Battle Effectiveness Awards, Marjorie Sterrett Battleship Award, two consecutive PACFLT ASW Bloodhound Awards for the most proficient ship in anti-submarine operations and two consecutive CNSF Unit Tactics Awards for combat systems proficiency including BMD operations. CAPT Dusek also served as the COMSEVENTH Fleet Deputy Operations Officer embarked on USS BLUE RIDGE (LCC-19) from January 2009 through February 2011, where he was responsible for all aspects of Fleet Operations in the C7F AOR. Ashore CAPT Dusek attended the Naval Post Graduate School in Monterey, CA, earning a Master of Science Degree in Physical Oceanography. CAPT Dusek received his second Masters Degree from the Naval War College in Newport, Rhode Island in 2006. While at the Naval War College CAPT Dusek was assigned as the sole US Navy representative to the Naval Command College, the Naval War College’s Senior International program. CAPT Dusek also completed a tour ashore assigned to Commander, THIRD Fleet in San Diego, California as the Current & Future Operations and Scheduling Officer. CAPT Dusek assumed his current assignment as Executive Officer on the USS ESSEX (LHD 2) forward deployed to Sasebo, Japan in May 2011. CAPT Dusek’s awards include the Meritorious Service Medal (3 awards), Navy Commendation Medal (3 awards) and the Navy Achievement Medal (3 awards). 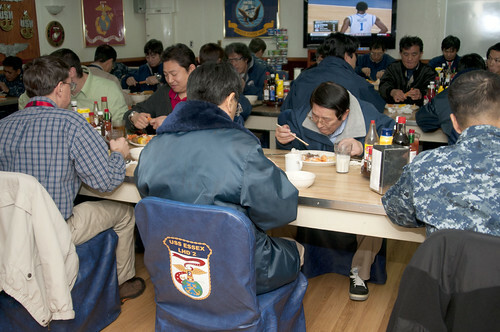 SASEBO, Japan (Jan. 18, 2012) – USS Essex (LHD 2) hosted a lunch for over 100 personnel assigned to the Japan Regional Maintenance Center detachment Sasebo (JRMC) Jan. 18. The lunch was held to thank the JRMC detachment Sasebo team for their services to Essex for over 11 years of being forward-deployed to Sasebo, Japan. 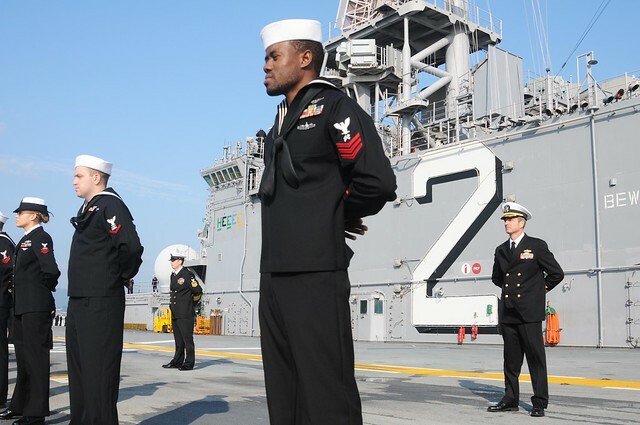 SASEBO, Japan – The flight deck of the forward-deployed amphibious assault ship USS Essex (LHD 2) was the backdrop for 35 Sailors and Marines, nine spouses and two children becoming U.S. citizens during a naturalization ceremony May 20. SASEBO, Japan – Japanese students from the University of Fukuoka had the opportunity to see the forward deployed amphibious assault ship USS Essex (LHD 2) up close and personal during a ship tour May 27. SASEBO, Japan - The forward-deployed amphibious assault ship USS Essex (LHD 2) departs Fleet Activities Sasebo to participate in Exercise Talisman Sabre 2011. 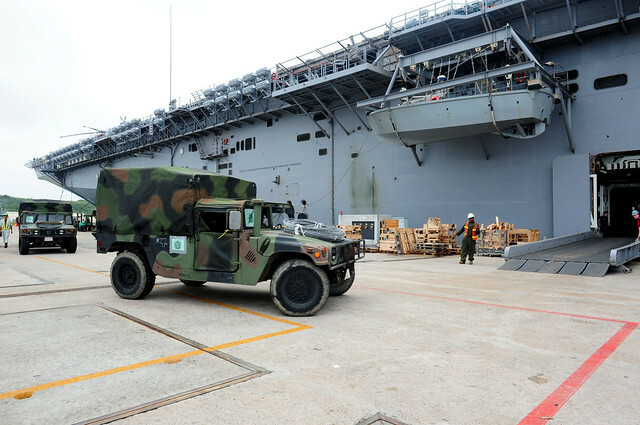 After onloading the ground elements of the 31st Marine Expeditionary Unit (MEU) at White Beach Naval Facility, Okinawa, Japan, the amphibious assault ship USS Essex (LHD 2) got underway to embark aircraft from the MEU's Aviation Combat Element (ACE). Cadets of the Japan Maritime Self Defense Force (JMSDF) working aboard the Shirane class destroyer JS Kurama (DDH-144) toured the forward deployed amphibious assault ship USS Essex (LHD 2). The crew of forward-deployed amphibious assault ship USS ESSEX (LHD 2) prepared for its upcoming Unit Level Training Assessment-Certification (ULTRA-C) by fighting a simulated helicopter crash/fire and responding to a simulated mass casualty scenario on the flight deck. SASEBO, Japan - Sailors from ship and shore commands across fleet activities Sasebo gathered aboard the USS Essex to discuss a number of important topics with Pacific Fleet Master Chief John Minyard. SASEBO, Japan (Sept. 2, 2011) - Capt. David Fluker, commanding officer of the USS Essex (LHD 2), addresses the ship's crew during a Centennial of Naval Aviation ceremony. 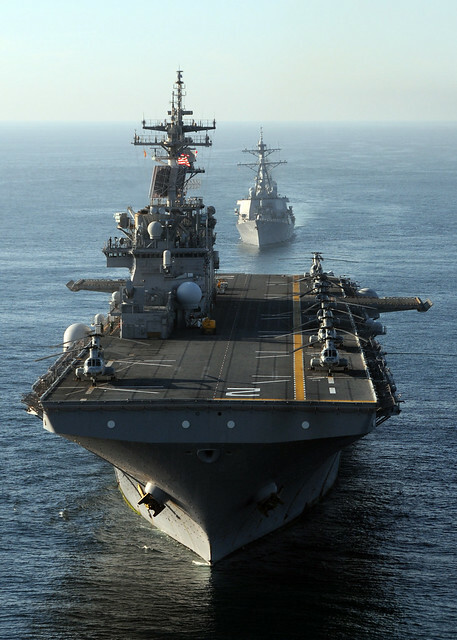 SASEBO, Japan - Ships of the forward-deployed Essex Amphibious Ready Group (ARG) departed Sasebo, Japan Sept. 21 to begin a patrol of the Western Pacific region. 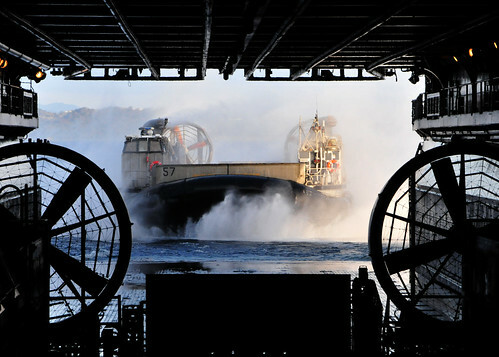 During the patrol, Essex ARG will embark and work with elements of the 31st Marine Expeditionary Unit to complete an amphibious integration training and certification exercise off the coast of Okinawa. 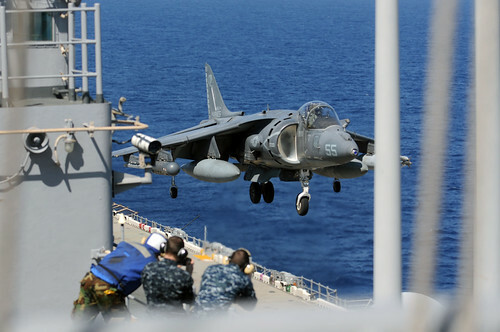 AV-8B Harrier with Marine Attack Squadron 214 lands on the flight deck of the forward-deployed amphibious assault ship USS Essex (LHD 2). USS Essex is part of the forward deployed Essex Amphibious Ready Group (ARG) and is conducting operations in the Western Pacific. SASEBO, Japan - Sailors aboard the forward-deployed amphibious assault ship USS Essex (LHD 2) completed an ordnance onload Sept. 23, to prepare for their deployment. 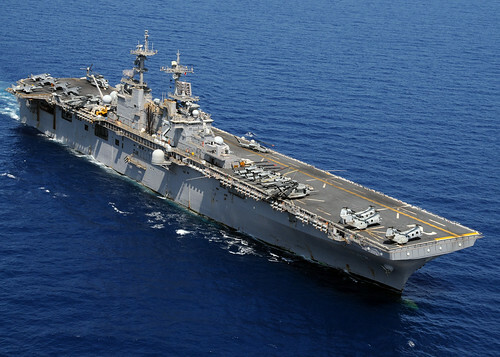 After completing the onload of the ground elements of the 31st Marine Expeditionary Unit (MEU) at White Beach Naval Facility, Okinawa, Japan, the amphibious assault ship USS Essex (LHD 2) got underway to embark aircraft with the MEU’s Aviation Combat Element (ACE). PHILLIPINE SEA - The forward-deployed amphibious assault ship USS Essex (LHD 2) conducted a replenishment at sea (RAS), which included a vertical replenishment (VERTREP) of supplies, with the Military Sealift Command dry cargo and ammunition ship USNS Matthew Perry (T-AKE 9) Oct. 3. 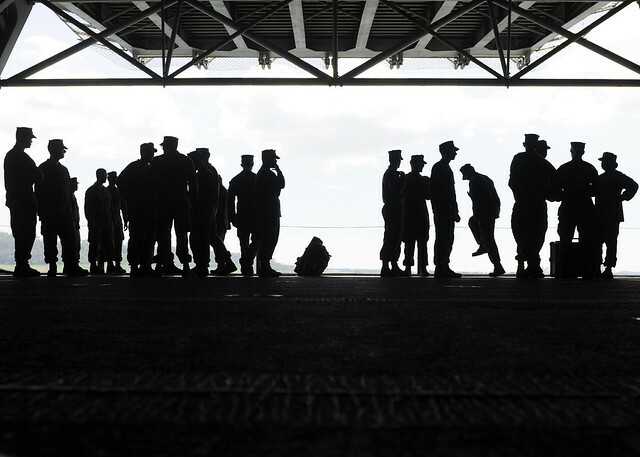 Marines assigned to the 31st Marine Expeditionary Unit (31st MEU) prepare to disembark the forward-deployed amphibious assault ship USS Essex (LHD 2). 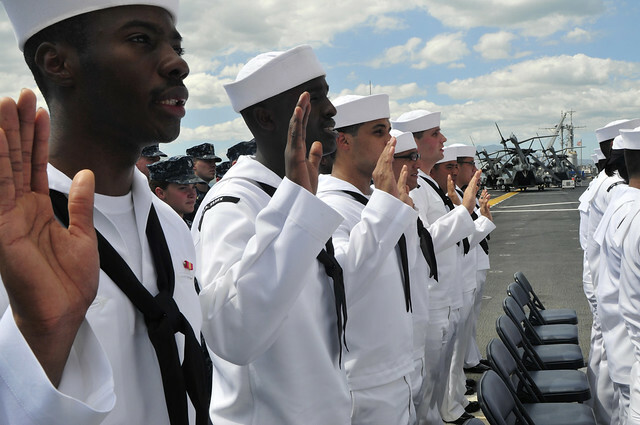 Eighteen Sailors became U.S. citizens during a naturalization ceremony on the flight deck of the forward-deployed amphibious assault ship USS Essex (LHD 2) Oct. 31. 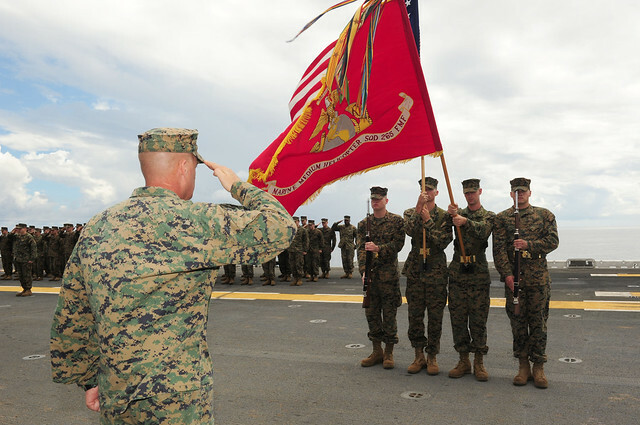 Sailors and Marines aboard the forward-deployed amphibious assault ship USS Essex (LHD 2) celebrated the Marine Corps’ 236th birthday on the ship’s flight deck Nov. 10. INDIAN OCEAN (NNS) -- The forward-deployed amphibious assault ship USS Essex (LHD 2) embarked four Indonesian military liaison officers during its current deployment, Nov. 14. BALI, Indonesia (Nov. 20, 2011) - The amphibious assault ship USS Essex (LHD 2) and guided missile destroyer USS Stethem (DDG 63) arrived in Bali, Indonesia Nov. 20 for a port visit during their deployment to the Western Pacific and Indian Ocean. BALI, Indonesia – Senior military and civil officials from the U.S. and Indonesia attended a reception hosted onboard the forward-deployed amphibious assault ship USS Essex (LHD 2) Nov. 20 to celebrate cooperation between the two countries. INDIAN OCEAN – Sailors and Marines aboard the forward-deployed amphibious assault ship USS Essex came together to celebrate the Thanksgiving holiday at sea. 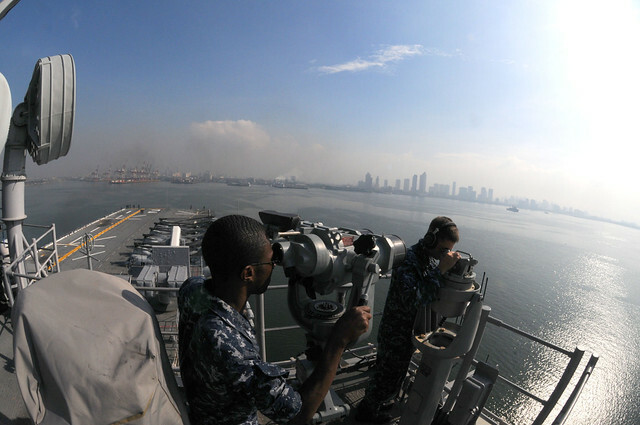 MANILA, Republic of the Philippines (Nov. 28, 2011) – The forward-deployed amphibious assault ship USS Essex (LHD 2) arrived in Manila, Republic of the Philippines Nov. 30 for a port visit. SASEBO, JAPAN (Dec. 8, 2011) The forward-deployed amphibious assault ship USS Essex (LHD 2) returned to Sasebo, Japan Dec. 8, after completing a two-and-a-half month patrol of the Western Pacific. SASEBO, Japan (Dec. 13, 2011) - Mr. Takashi Shima, a painter and photographer for over 50 years, visited the forward deployed amphibious assault ship USS Essex (LHD 2) Tuesday Dec. 13 to deliver a painting of the ship to the commanding officer, Capt. 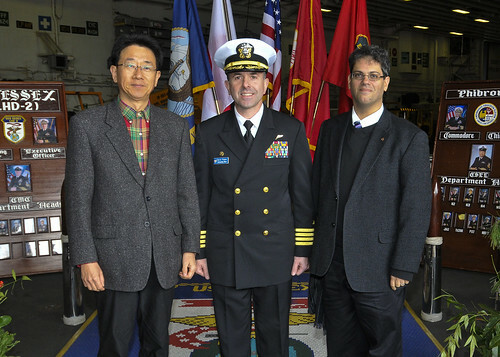 David Fluker, in recognition of its participation in Operation Tomodachi. The water color painting shows Essex at sea during flight operations with several CH-53E Sea Stallions flying overhead. SASEBO, Japan - The Republic of Korea Consulate General Cho Jung-Won and Principal Officer U.S. Consulate Fukuoka Jason R. Cubas visited forward-deployed amphibious assault ship USS Essex (LHD 2), Dec.
SASEBO, Japan - The Republic of Korea consulate general and the principal officer U.S. Consulate Fukuoka visited forward-deployed amphibious assault ship USS Essex (LHD 2), Dec. 29. SASEBO, Japan – The Chief of Navy Chaplains, Rear Adm. Mark L. Tidd visited the forward-deployed amphibious assault ship USS Essex (LHD 2), Jan. 6. SASEBO, Japan (Jan. 17, 2012) – Sasebo’s Navy League held their first business meeting of 2012 during a dinner held onboard USS Essex (LHD 2) Jan. 17. SASEBO, Japan (Jan. 23, 2012) – Rear Adm. Gerard P. Hueber, commander Expeditionary Strike Group 3, visited the forward-deployed amphibious assault ship USS Essex (LHD 2) Jan. 23, to discuss with Essex leadership the upcoming hull swap with USS Bonhomme Richard (LHD 6). 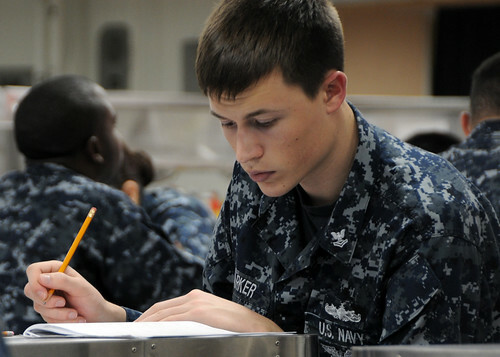 OKINAWA, Japan (March 1, 2012) Yeoman 2nd Class Kyle Parker takes his first class petty officer advancement examination aboard the forward-deployed amphibious assault ship USS Essex (LHD 2). 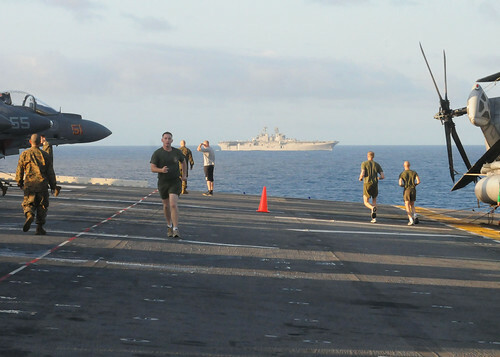 PHILIPPINE SEA (March 8, 2012) – Sailors and Marines conducted physical training on the flight deck aboard the forward-deployed amphibious assault ship USS Essex (LHD 2). 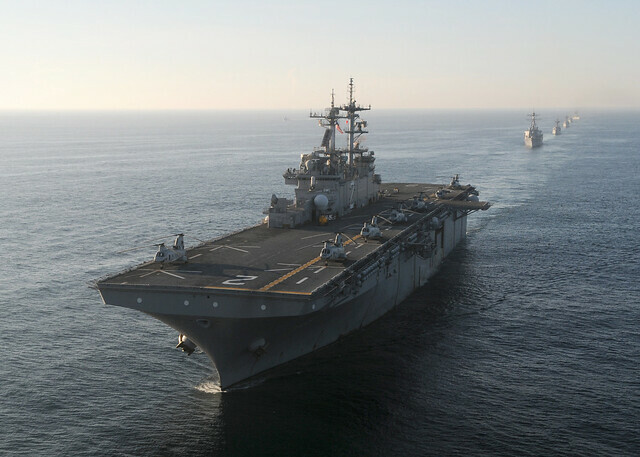 SOUTH CHINA SEA – The forward-deployed amphibious assault ship USS Essex (LHD 2) successfully embarked aircraft and aircrews from the 31st Marine Expeditionary Unit's (MEU) Air Combat Element (ACE), March 5. 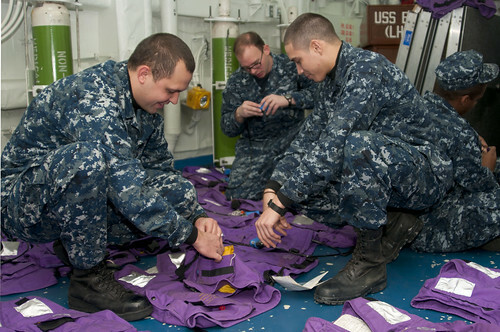 PHILIPPINE SEA (March 10, 2012) - Capt. 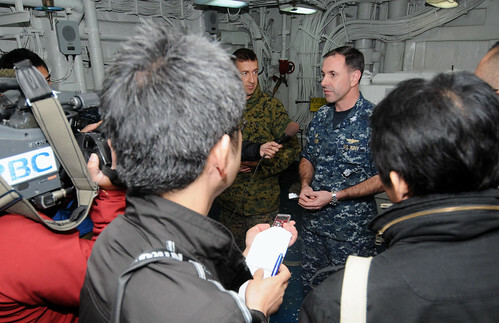 David Fluker, commanding officer of the forward-deployed amphibious assault ship USS Essex (LHD 2) answers questions for Japanese press during a media visit March 10. Essex, is the lead ship of the only forward-deployed amphibious ready group.